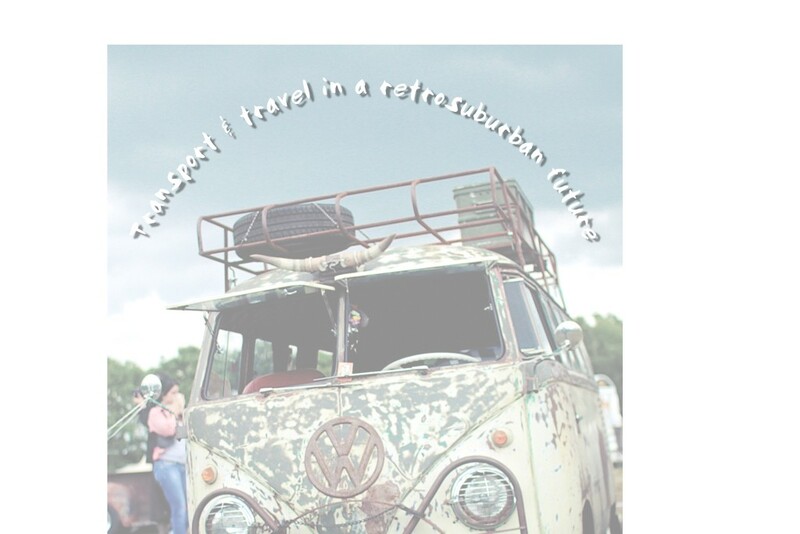 AS in reviewing other chapters of David Holmgren’s Retrosuburbia I find no disagreement substantial enough to make me question the premise and content of the book. We could have a livelier discussion were there disagreement because we could get at the philosophical underpinnings of David’s worldview and his proposed solutions. Most of the differences I find with David’s ideas are minor. We appear to share much the same worldview. The differences I find with some of what David writes come from our different life experiences and lifestyles — David’s being rural, mine in the higher-population/medium-density environment of a big city. Perhaps it is our interests which explain how we sometimes see things differently. David is a landuse designer and permaculture teacher who over the last couple decades has turned himself into a public intellectual. My work has been in journalism, in different media. That exposed me to new ideas and the politics around them and led me to ask questions about motivation and agenda. I also worked in international development and fair food advocacy, as well as permaculture education. Out of that came my interest in the relationship between technology and society, how technology influences public and private behaviour and how they shape each other. Perhaps this accounts for my questioning some of David’s attitudes to modern technology. Its claim to be disruptive is true at one scale because it disrupts patterns of personal and public behaviour, education, economics, communication and more. I see modern technology as the latest iteration in the coevolution of humans and tools. Coevolution? Yes, we can trace that back to the evolution of the opposable thumb. This made possible the manipulation of matter and the manufacture of tools, whether those are the wood and stone tools of the neolithic or the digital tools of our time. Humanity has thus evolved alongside its tools. Digital is the latest tool set we have made. Technology is a continuity and a fellow-traveller with humanity through its long evolution. We evolved together. We are inseparable. Some might see conceit in what David writes about. As he states, he writes for a minority of people who live mainly in Victoria, people who are not struggling financially or otherwise, and who have the option to engage in downshifting. That appears to exclude people in the higher-population, inner urban areas of our cities as well as those already struggling with finances, health or other issues. Despite this, Retrosuburbia’s ideas can be reinterpreted and tweaked to fit that demographic. I know that because my partner and I did it long before David’s book appeared. Different strategies are needed, however the principles remain the same. I say that some might find conceit in the notion of downshifting and living a low-consumption, low-waste lifestyle because they or those they work with lack that option. I have had contact with people like that in my work in local government, however I found that some of them engage in their own version of communitarianism and some grow a little of what they eat in the community gardens in social housing estates which my role supported. Yet, not all have that opportunity, in part because they remain subject to the priorities and decisions of departmental public servants. Thus, they might resent those David writes for because insecurity is part of their lives. Like other topics David discusses in Retrosuburbia, Chapter 26, Transport and Travel, offers as solutions much that already exists. Just as permaculture synthesises other knowledge systems and brings them together as a coherent design strategy for resilient living, so does David bring together those existing solutions and synthesise them through the pages of Retrosuburbia as potential solutions for an uncertain future. In the context of the present time and the emerging sense of uncertainty that now pervades society, the small solutions in this chapter can be regarded as proof-of-concept iterations and as prototypes which could be copied and scaled-up. In doing that, we already have a great copying machine for sharing these solutions. It is called the internet. What follows, then, is a review that is more supportive than scathing. As in my reviews of previous chapters, I raise questions about details and extrapolate some of the ideas presented. Peak oil: notion or fact? David writes that global oil production peaked a decade ago and what remains is expensive and difficult to extract. Production at Australia’s Bass Strait oilfields peaked in the 1990s. Gas is now the main product although production may soon peak. This accounts, in-part, for investment in fracking to extract gas. It seems fossil fuel corporations are set on using the last of the hydrocarbons before switching to alternative energy sources such as renewables or nuclear. That is understandable given the level of investment in existing oil and gas infrastructure, however it has collateral damage such as the carbon emissions implicated in global warming. I don’t know if predictions of impending peak oil take into account the reserves believed to lie below the northern polar ice cap. Arctic nations will move on those as the ice cap shrinks in extent. As well as seeking to become the regional, and later the global hegemon as it grows in economic and military power to compete with the US, China’s occupation and militarisation of islands and reefs in the South China Sea, and its disregard for competing territorial claims by neighbouring South East Asian nations, might be in-part accounted for by the presence of oil and gas reserves. None of this avoids peak oil. It just postpones the crisis. While that might give us time to develop alternative energy sources, doing that depends on government and corporate willingness to significantly invest in their development. Meanwhile, people are investing in home photovoltaic and battery storage systems to save costs over the long term and to decrease household reliance on centralised systems. Were some far-sighted government (is such a thing conceivable?) to offer financial and political support to scale-up the installation of such systems, there is potential to link them into regional energy networks like an energy internet. This would make use of surplus production, much as grid-connected systems already do, and would be a hedge against local power outages. They would not replace centralised generation but would supplement it and open the opportunity for regional energy production cooperatives that could supply power to the region directly or sell it to centralised systems for a better price than individual householders can obtain. Localisation: real or false solution? In proposing we “kick the commuting habit” and work from home, David reiterates the call of the Transition Towns movement of more than a decade ago. That focused on rebuilding local economies as did the then-spokesperson for BALLE — Business Alliance for Local Living Economies — Michael Shuman, when Randwick City Council sponsored his workshops in Sydney. Several years earlier and before Transition Towns got underway in Australia, in 2007, Judy Wicks from BALLE spoke at Australia’s first conference on localisation in Brisbane. The bicycle, propelled by foot or electric motor, is a low-cost means of local transport that well-fits the localisation agenda. Some cut their commute by telecommuting, an opportunity brought by the internet and high-speed broadband. It enabled some to sell their urban home and move to rural towns. Over the years I have met several people who did this, and it works. Others chose to stay in the city and work from home. The number increased in line with the emergence of the gig economy, as the short-term contract work market for freelancers is known. Those are the fortunate few. Anyone attempting to reduce or avoid their commute has to convince their employer they should work from home, find a local livelihood or become self-employed. Self-employment means having or gaining skills in work for which there is demand, competing with any existing providers of those goods or services and dealing with the hassle and hours of running your own business. For many skills, local jobs do not exist. That is because industry clusters geographically. Sydney’s IT sector, its medical clusters adjacent to hospitals, the adventure sports retail cluster in the city and educational clusters such as the UTS/TAFE/Sydney University cluster are examples. Workers come to them rather than their decentralising their work to telecommuters. The suburbs themselves are big contributors to commuting. New suburbs usually have limited public transport, encouraging commuters to use private vehicles. That is especially so when the workplace is not on the train line. The development of higher-density residential clusters around major railway stations might offer some local jobs but for many with specialist skills, there is no option to commuting. 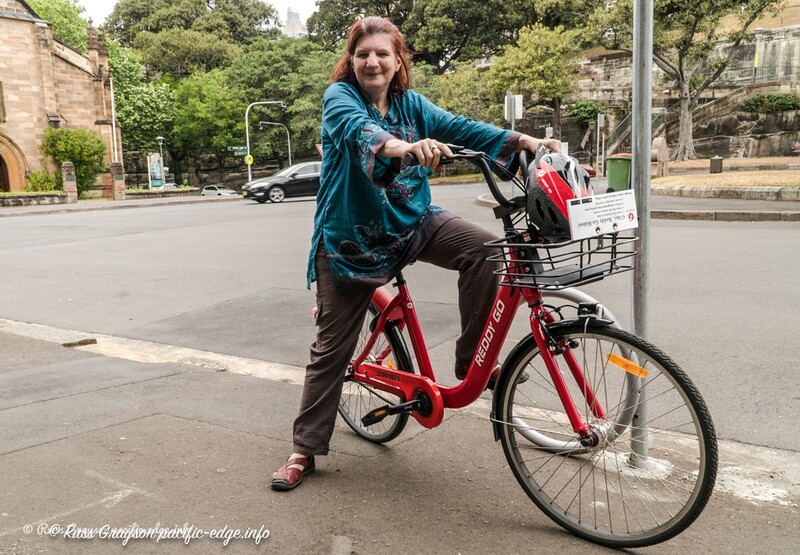 Having offered these barriers to reducing the commute, I should say that my partner and I cut our commute when we moved from living in a shack among someone’s fruit trees on Sydney’s lower Northern Beaches to the Eastern Suburbs where Fiona could easily walk to walk. That saved her up to three hours or more commute a day and placed me close to the bus to commute to my local government position in the CBD. There is another element to what David writes about working from home. It is political and it shows how, unknowingly, permaculture people sometimes cross political boundaries between Left and Right. It is this: the idea of quitting your job and working for yourself reflects the libertarian notion of everyone being their own business and contracting out their services. It is not that those doing this have any political motivation or any consciousness of the links to political ideology. Their decisions are pragmatic. It comes about because permaculture has no formal political position on the Left/Right spectrum. I should point out that, like socialism, libertarianism is a broad concept spanning the pro-corporate, free enterprise model prevalent in the US and popularised in the 1950s by Ayn Rand, favoured by the political Right, and the communitarian, social libertarianism of Murray Bookchin which some would see as leftist although it might eschew the conventional Left. Permaculture straddles the individualism of the liberal economic model and the communitarianism favoured by some of the Left. I have seen neoliberal ideas come and go in permaculture as well as those of communitarianism. This political meta-system exists in an orbit well-beyond the thinking of most permaculture practitioners. It does not detract from what David writes about reducing or ending the commute. It may be that technological developments, such as artificial intelligence and augmented reality, will be what makes cutting commuting possible for more people. If we need a motor vehicle, we have to make a number of decisions. First is whether we need a small passenger car, a cargo van, a people-mover or an all-wheel-drive? Decisions made, we have to open the app on our mobile phone and make the booking. All of those vehicle types are within five to ten minutes walk of where we live. The density and choice of vehicles is a function of the viability of specialised services that comes with denser, higher-population numbers in suburbs closer to the city centre. We don’t need to own a car, we just want want to use one occasionally. David points out some of the disadvantage of motor vehicles in Chapter 26. I find much to agree with, in-part because he mentions things which we do such as using public transport for longer journeys and walking, to work for Fiona and down to the beach or the suburban commercial centre for both of us. David mentions bicycles for shorter journeys. We once had mountain bikes, however our suburb is too hilly to avoid being drenched in sweat by bicycling. Without a car, we joined GoGet, the carshare scheme, and have access to those three small cars, two cargo vans, a people-mover and an all-wheel-drive, all easily booked on an app and within short walking distance. Just down the road is someone’s car with a Car-Next-Door sticker on the door. That is another carshare scheme by which people rent out their vehicle during its idle hours when they do not use it. 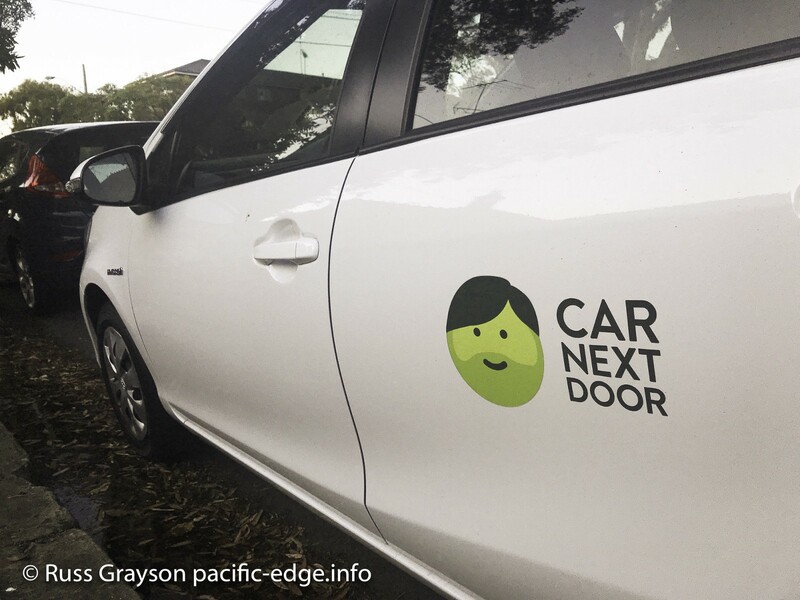 Car-Next-Door is a vehicle-access alternative. Ride sharing/car pooling have not gone away and now there are apps for it. Shared ownership is another idea David discusses in the book, though far less common than other practices. Once, she has a bicycle which she rode around the neighbourhood. Then she had an accident, not on her bicycle but when rock scrambling on a mountain. Now, she has a hip injury and wishes she could still get around on a bicycle like she once did. The woman is one of many who are all-too-often ignored by those positioning bicycling as the preferred means of transport. They rightly point out the utilitarianism of bicycles, however bicycling is not for all. Thus it was good to find David acknowledge this in this chapter of his book where he speaks of the potential of the pedal-assisted, electric bicycle. That is what the woman with the hip injury is doing. Assisted by an electric motor powered by a lithium-ion battery, a pedal-assist mountain bike will allow her not only to get down to the local store, it will enable her getting out on some of the trails as she once did. The bicycles, as David acknowledges, have the potential to bring mobility to ageing people, another demographic often overlooked by cycling advocates. Greater potential comes in the form of an electric-pedal-assist folding bicycle. This is useful when travelling because it can be carried in a vehicle and, for those living on unpaved roads or with a taste for the gravel, it comes in folding, electric mountain bike variants. A newer alternative are app-enabled, pedal-assisted electric bicycle hire like Lime whose bicycles we find distributed on footpaths through the suburbs; the company is presently negotiating with the state government to allow its electric scooter hire to start in NSW because, as I understand it, electric-powered vehicles that are not pedal-assisted are regarded as motor vehicles. Bicycling has been made safer with the opening of bicycle lanes and now forms the preferred commute transport of a growing number. A rickety-looking mashup of parts, a hybrid that may, or may not, work all that well. David mentions Uber in his solutions, but not the working conditions of drivers and how they rate and are rated by passengers. Uber, like AirBnB, is an iteration of platform capitalism. The corporation owns no vehicles and drivers are self-employed. Unlike many taxi drivers, another long-established public transport model, Uber drivers have the costs of vehicle maintenance, insurance, self-employment, no holiday time or other workplace benefits. The Uber model is being legally challenged by some city governments overseas. Some economic thinkers say the Uber model would be fairer were it run as a drivers’ cooperative. Mobile phones and their apps are opening new opportunities in getting around and enabling new models of transportation businesses to make a start. It is especially where those businesses form as cooperatives that they better fit the retrosuburban model. The file room was a large space with rows of filing cabinets secured behind strong, wire mesh walls. Here, tens of thousands of files on people were kept on paper as pages in cardboard folders. Working in the file room was not popular and I was fortunate not to have had to do so when I worked for the federal government department. Now, those paper files would be archived in some government storage facility and the files exist only as assemblages of digital bits in a large database. The paperless office has arrived. Curiously, David claims the paperless office failed to materialise. My experience is the opposite. When I later worked in local government, all records were online in a database. Although we still got together to plan projects or to solve some problem, what we came up with was stored digitally. Later still, I could carry my work and its files in my iPad or mobile phone. All I needed to work was a digital device and an internet connection. It is the same for many. I would have liked David to extrapolate his notion that the paperless office failed to materialise. Perhaps he has seen examples where that is true, however the paperless office in my experience is largely an artefact of the pre-digital age. 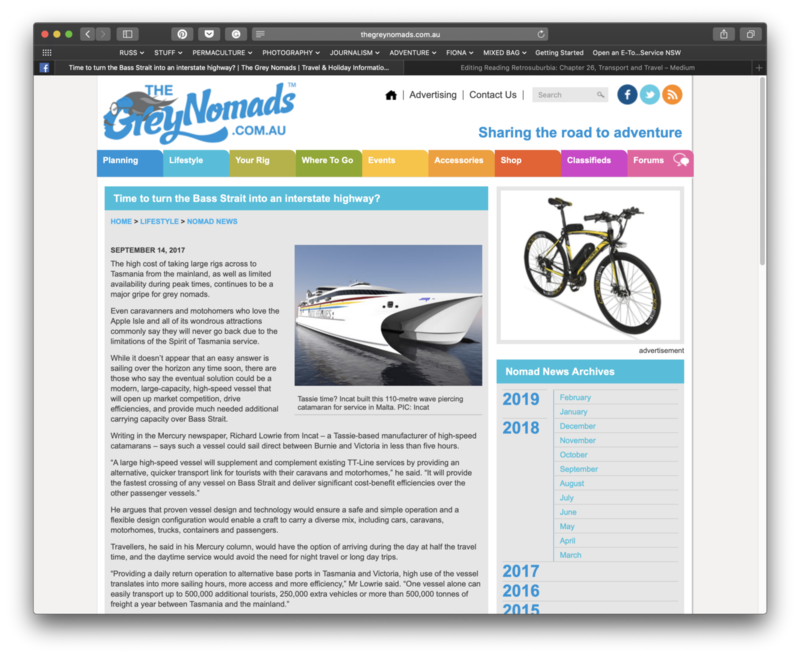 David briefly writes about the paperless office where he says that the internet is the opportunity to decrease personal travel. I have already mentioned the practice of telecommuting. He also says that online tech isolates people at their workstations or on handheld devices. Like comments about people glued to their mobile devices on public transport without considering what they are doing with their devices, this statement mistakes form for content, appearance for substance. How is sitting in front of a screen or a handheld device different to people isolated at their desks in front of a stack of files in the days before online tech? What we see is the same behaviour with different media. David is not a technopessimist, as becomes clear on reading Retrosuburbia. He is a tech-skeptic and, like any true skeptic, he remains open to the positives and negatives of technologies. However, his suggesting that the virtual communities of the online world are somehow inferior to physical community comes across as a value statement. Whether it is or not depends on an individual’s access to a physical community with which there is some affinity, and the value that they gain from it. Unlike David, I do not see virtual communities retarding the development of geographical communities. They are different, just as valuable and work best when complementary. Do I read a polarisation of virtual and physical in David’s comments? Do they create a division when it might not exist? To state it as a universal truth sidesteps the nuances of device use. For many, the virtual and physical are fellow-travellers. Virtual enables the physical to happen and continues conversations started at physical meetings. In describing nature and people as a remedy to online connection, David positions online as a disease. It could be like that when people overuse digital devices, and that certainly does happen although it is more cliche than an absolute truth. For most of us digital and online are less a disorder than a complement to each other. Just as permaculture values diversity, so do people use tech in diverse way. This makes generalisations and sweeping statements risky. I find much to agree with David in his saying that the internet is an opportunity to decrease personal travel. In the form of telecommuting, that applies especially to travel for working. “A bicycle and broadband might be the emblematic makers of a growing minority across the generations staying fit and moving locally but being wired for the world”, David writes. Households provide security, refuge, social learning and are a base from which to venture out into the city or community. If they are harmonious. That is why I agree in principle with David’s description of the household as the “beating heart from which to build community”. A problem that comes with all-encompassing statements like this is that they are not universal. Why? Because the experience of the household is not good for all. There are problems in families and that has much to do with workplace pressure being transferred to relationships at home, to financial insecurity and the expense and demands of domestic living. When those demands rob household members of time together you could be forgiven for thinking there is a chronophage at large (a creature that eats time). Domestic time poverty is one reason why restaurants, cafes and home food delivery, do well. Uber Eats filled a gap created by a lack of time at home and tiredness after a day spent working. Let me step into political territory and the culture wars again. It is understandable that some might see in David’s placing the household in social centre-place as permaculture having a streak of conservatism about it. Would they be right in seeing parallels with right-wing family-first thinking in focusing on the family as the basis of society? The right has politicised, has weaponised, the family. What they mean in doing so is the nuclear family. 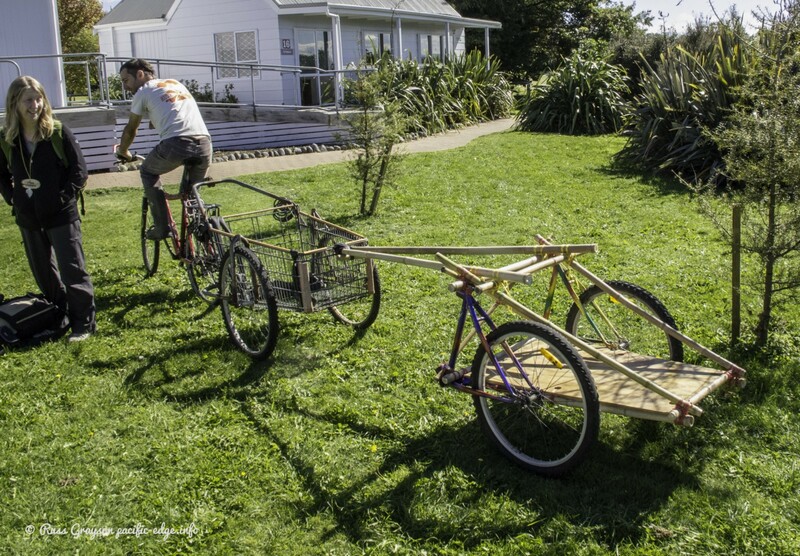 But, for many both inside and beyond the permaculture milieu, the household is a variable entity that might be a sharehouse arrangement, a multi-generational household or some other construction. It also neatly ignores the reality that people who describe themselves as leftist or social-libertarian live as families and also see the household as a basic component of our societies. I can’t conclude this review of Chapter 2 without looking at what David calls ‘traveller lifestyles”. I do this because the lifestyle has long been of interest to me and because, for relatively short periods, I have lived it. First, though, a comment on another of those forms of platform capitalism, AirBnB. I find it curious that David mentions it as a model of low-cost, long-stay travel. A friend in another city rents out her spare room on AirBnB. Another does so with her attached apartment. And another uses AirBnB to help pay his family’s mortgage. For all but the first, their AirBnB does not offer either low-cost or long-term accommodation. As for the claim that it is a way to live among locals, that is frequently not the reality at all. that in which AirBnB has created a new real estate investment industry in which people with access to credit (or, alternatively, debt — same thing, a bank’s credit is a borrower’s debt) invest in multiple properties. The second type takes properties off the rental market and pushes up rents. It is producing a backlash against AirBnB overseas and in Australia. When people invest in property to turn into highly-profitable short-term AirBnB rentals, their profit and their clients convenience comes with a social cost. Less so with renting out the spare room because without the potential for AirBnB to help pay the mortgage, the room might never be rented. I think permaculture folk need distinguish between the two models. Engaging in the latter brings into question the value they place on permaculture’s second ethic of care of people and its third ethic of distributionism. Grey Nomads are retired people have sold their homes and live on the road. David talks of “the joys of slow and thoughtful travel” and cites WWOOFing as an example: Willing Workers On Organic Farms — a farmstay scheme that exchanges visitor labour in return for food and accommodation. He also mentions the travel of seasonal workers and that of mobile living to sample different locales in search for somewhere to settle. My research into mobile living leads me to define several types, voluntary and involuntary. 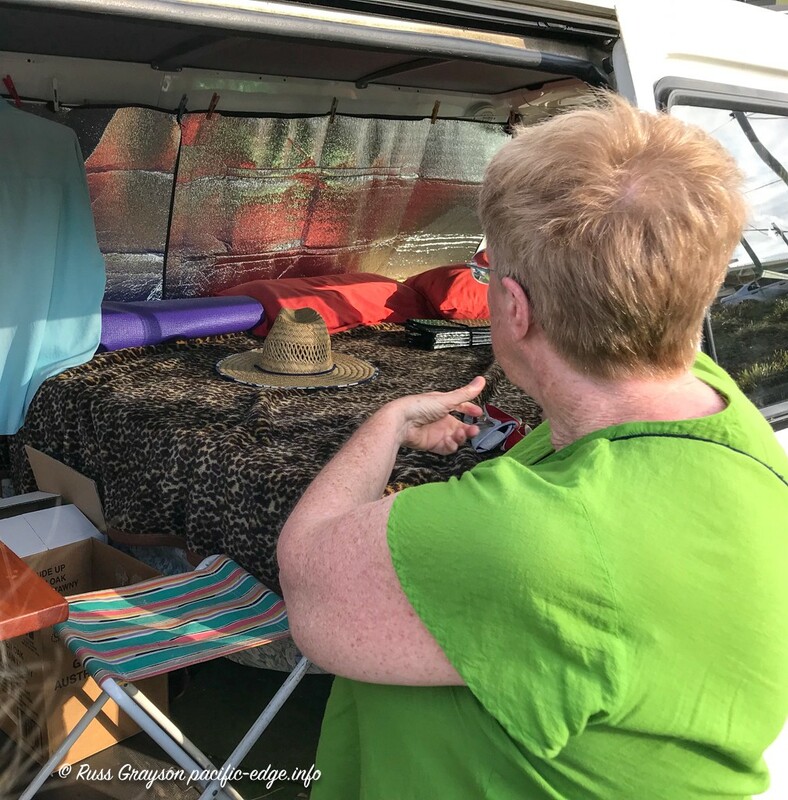 the van as adventure vehicle to take people to national parks and into wild country as a base camp to engage in bushwalking, climbing, skiing, canoeing, pack rafting or surfing. living in a vehicle enforced through job loss or relationship break-up and the consequent inability to afford the costs of fixed-address living such as rent and utility costs. Our vanlife is the van as adventure vehicle. We have endured frozen night temperatures below the Falls Creek ski fields and sweated away subtropical evenings by the beach. Life on the road is not always as it is depicted in idealistic Instagram photos. Judy shows me around her home on the road. While I have questions around some of the ideas in Chapter 26, I have little substantial disagreement with what David writes. Thus, my comments are mostly extrapolations of what David says and ruminations on their big-picture context. I would be interest in seeing some critical reviews of Retrosuburbia such as came out when David released an earlier book that commented on town planning. That elicited criticism of his ideas on urban food production, saying that the city is not the farm. It gave us disagreement substantial enough to mentally grapple with.